U.S. Secretary of State Hillary Rodham Clinton on Tuesday urged Arabs and Israelis to set aside their historical differences, avoid inflammatory rhetoric and recommit to attaining a comprehensive peace in the Middle East. In a speech at an international forum attended by senior government officials from the Mideast, North Africa and several major industrialized countries, Clinton struck a serious, cautious tone as she raised the matter of pursuing a comprehensive peace deal. "I know this is a matter that is of grave and pervasive concern among the countries represented here, but even far beyond this region," she said. "We are committed to a two-state solution," she added, referring to the long-running U.S.-brokered effort to establish separate Israeli and Palestinian states. "And we are determined and persistent in the pursuit of that goal." After speaking, Clinton was flying to Cairo for a hastily arranged meeting with senior Egyptian government officials, including President Hosni Mubarak. She had been scheduled to fly home Tuesday but said late Monday she would be traveling instead to Cairo to continue consultations on the peace process that she began Saturday in separate talks with Israeli and Palestinian leaders. The decision appeared linked to Egyptian concern about signs of a recalibration of the U.S. approach to the peace process. Clinton caused a stir Saturday in Jerusalem when she said at a joint news conference with Israeli Prime Minister Benjamin Netanyahu that his government's offer to restrain - but not stop - settlement activity in the West Bank and east Jerusalem was unprecedented. She offered unusually strong praise for Israeli peace efforts without explicitly mentioning positive acts by the Palestinians. Arab governments interpreted her comments in Jerusalem as a tilting of U.S. policy toward Israel, but on Monday in Marrakech, Clinton issued what she called a clarification, saying her words in Jerusalem were meant as "positive reinforcement" for the Israelis. She added that Israel's effort still fell far short of U.S. expectations, and she added strong praise for the Palestinians. She said the U.S. still believes that continued Israeli settlement activity is illegitimate - a point she failed to emphasize in Jerusalem. In her speech Tuesday, Clinton referred to the importance of language, although aides said she was not referring to her own remarks in Jerusalem. 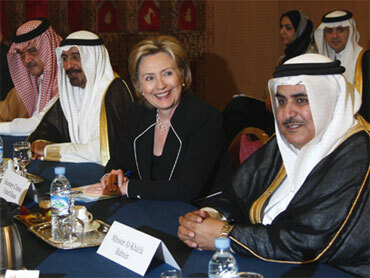 She urged a united effort in pursuit of the goal of comprehensive peace in the Mideast. "And I think that does require that all parties should be careful about what we say - the kind of recriminations that are so understandable. But we need to work together in a constructive spirit toward this shared goal of a comprehensive peace. I feel very strongly that it is attainable." Clinton said President Obama will not give up in his efforts to work through "the difficult and tangled history" of the Mideast conflict. "As leaders of countries that have a direct stake and care deeply" about the fundamental issues that have to be resolved in Israeli-Palestinian negotiations, she said, "I would just ask you to think about how we can each demonstrate the commitment that is necessary for us to go forward. We can maintain an allegiance to the past, but we cannot change the past. No matter what we say about it, it is behind us." Israeli-Palestinian negotiations broke off more than a year ago. Palestinian leaders have said they will not return to peace talks with Israel unless it halts all settlement building on lands they claim for a future state, and they believe Israel has blatantly defied a U.S. demand for a settlement freeze. Palestinians see Jewish settlement building as one of the biggest threats to their ability to form a viable state in the territories of the West Bank, east Jerusalem and the Gaza Strip. About 500,000 Israelis live in settlements in the West Bank and east Jerusalem. Israel withdrew from Gaza in 2005.